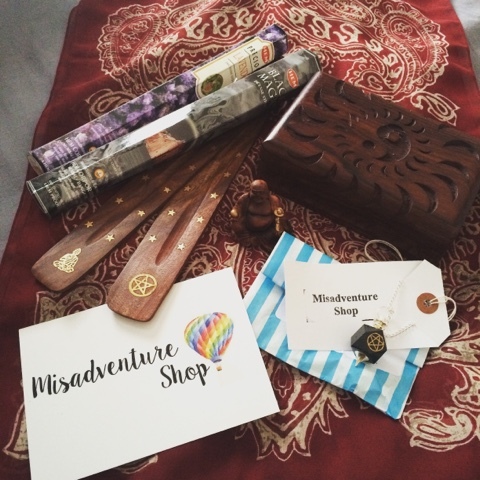 A couple of weeks ago I received a new follower on Instagram from 'Misadventureshop' whenever I get new followers or likes I check out their profile. 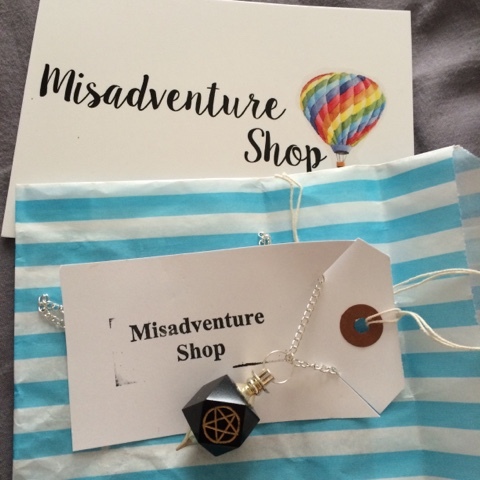 Misadventure Shop is a small business from North East England who sell home made jewellery and trinkets. 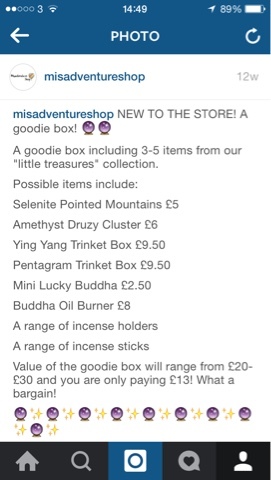 On Misadventureshop's Instagram I noticed that the store sold a 'Little Treasures goodie box' which had a selection of items in it worth up to £30.00 for only £13.00! Bargain I'd say! 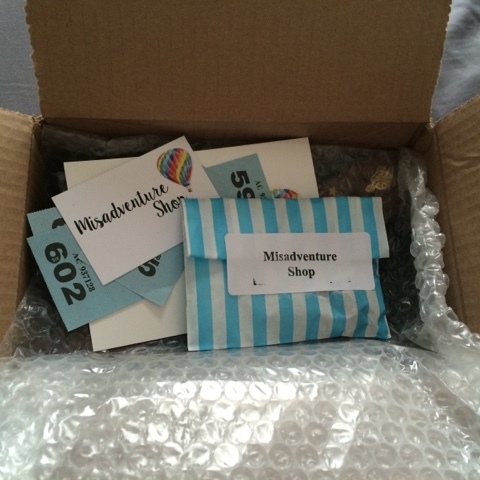 After looking through the shops Instagram, I went to the website at http://misadventureshop.co.uk and added a Little Treasures goodie box to my basket! Looking through the website I spotted lots of other items to my taste, I also added the Pentagram Pendulum Necklace to my basket, this was priced at £8.00. Back on Instagram, the store was running a discount code to get 50% off your whole order with the code 'JUNE15' which was a big discount. 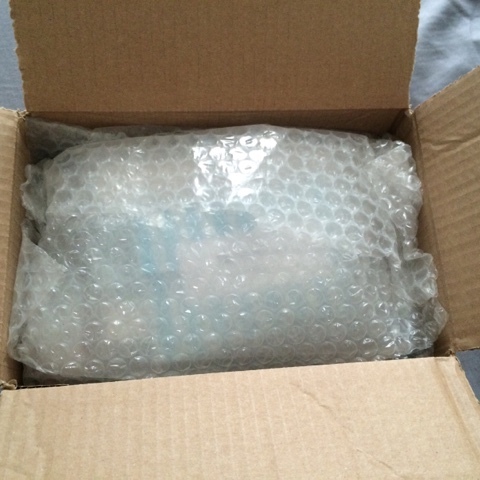 Today I received my order which was packaged perfectly in a box and bubble wrap. The necklace was also in a small gift bag sealed with a branded sticker. 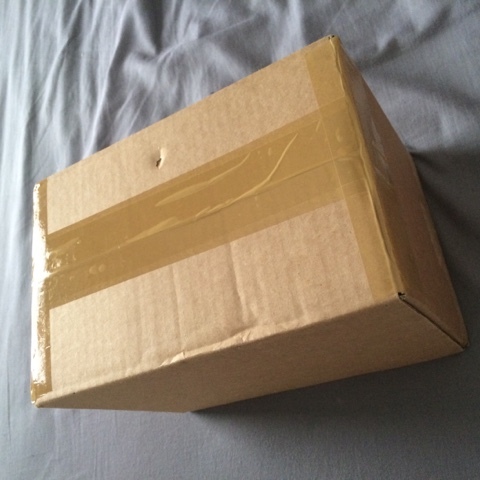 In the package was also some raffle tickets which at first I was a little confused about but looking further into Instagram, I found that with every pound you spend you get sent a raffle ticket and every month a raffle number is drawn and prizes are given out to the holder of the winning ticket. My favourite item in my whole order has to be the Ying Yang Trinket box! The shop sells them for £9.50 so to receive one in the goodie box I was really chuffed! I can see that this small business is at the beginning of its journey and with even small purchases the business will grow! I will defiantly be a returning customer!